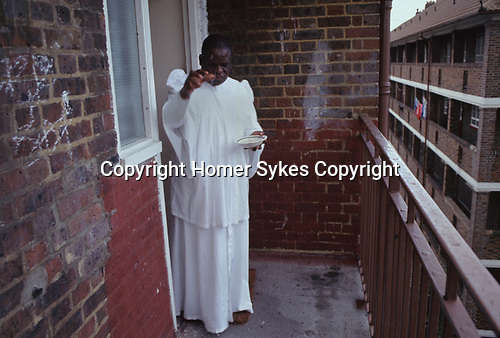 Home Meeting, in the district of Elephant and Castle, South London. UK. Church members have gone to bless this apartment, that a members has just rented. The apartment is being blessed holy water sprinkled in all the rooms and on the landing. The Church of the Brotherhood of the Cross and Star. A Nigerian church in Britain. This semi Christian church was founded by Olumba Olumba Obu known as OOO. His members worship him and Christ. He believes that he is the eighth and final reincarnation of the Godhead.